The basis of playing the guitar is knowing the notes on the fretboard. You’ll have to learn guitar notes if you ever want to play anything on your own, be it chord strumming or lead guitar. First of all, you should definitely watch our video lesson on guitar fretboard notes. It’s really informative and will show you how to remember the notes on the fretboard, without having to memorize them all. The basis of music are notes, which are the pitch of sound. All notes can be covered with the above notation, since the musical alphabet restarts over and over as you move up or down the notes. If you start out from any given note, and reach it again either up or downwards, you will be one octave away from the starting note. The reason is that doubling, or splitting in half the frequency of any note will result in the same note, only one octave higher (the OCT in OCTave is latin, for eight, after the eight notes in the musical alphabet), so they can actually be called pitch classes. In the standard EADGBE tuning, the notes on the neck of the guitar will be distributed like this. You might want to print this diagram, so you'll always have it handy. Understanding fret intervals is pretty straight forward actually. One fret left or right from a given note on the fretboard, no matter whether its up or down the neck, is known as a semitone, or half-step, or half-note. These 3 expressions mean exactly the same thing. Two frets left or right from any given note on the guitar fretboard is known as 2 semitones, or whole-step, or whole-note. Again, you will hear these terms used in a mixed fashion, just know that they mean exactly the same thing. I prefer using semitones, since I found that beginner guitarists understand it better. So again, one semitone is one fret, 2 semitones is 2 frets, 3 semitones is 3 frets, and so on. Here is an example, this is true for all notes on the chromatic scale. Its important to know, how the notes on the strings are interrelated. Knowing this, you will be able to tune your guitar, form chords and understand scales better. When you pluck fret 5 of most strings (with the exception of string G), you will get the exact tone of the string higher in pitch from the given string. This is because the strings are tuned to be 5 semitones apart (4 semitones with the G -> B strings). Try it for yourself. 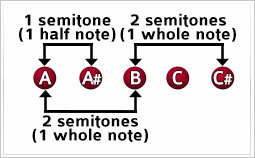 If your guitar is in tune, the notes should be the same as describes in the note diagram above. From the string relation diagram, you could already know how intervals work from one string to another. For example, since fret 5 on the low E string is the same pitched note as plucking the A string open, one semitone (or half note) up from fret 5 would be fret 1 on string A.
Consequently, 2 semitones (or one whole note) up from fret 5 string E, would be fret 2 of string A. Knowing the notes on the guitar, and knowing the relation of the strings is vital to any guitarist. If you want to see learn an easy way of remembering the notes on the fretboard, watch this video lesson on guitar notes.